Catch the exclusive live broadcast of GRANRODEO on July 22 performance from Zepp DiverCity Tokyo at the SM Megamall Cinema 6 from 6PM! 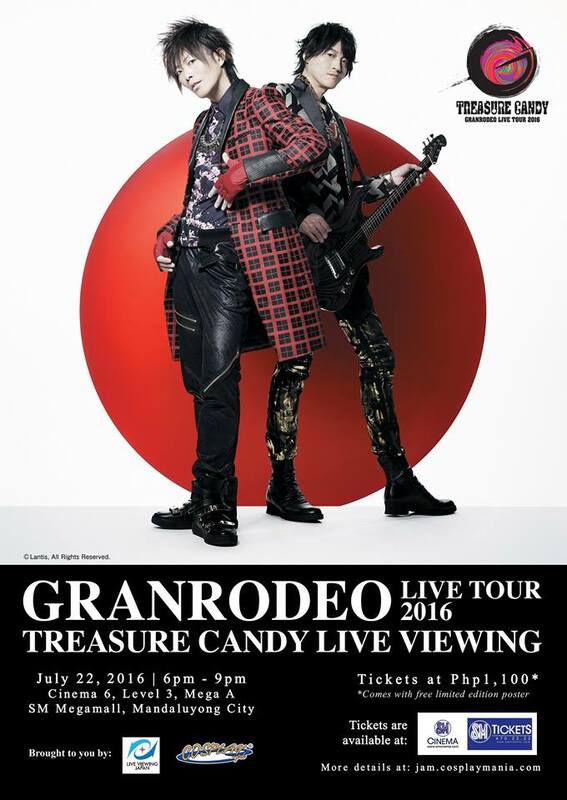 The famous rock band GRANRODEO’s live tour concert “GRANRODEO LIVE TOUR 2016 TREASURE CANDY,” which is to be held on Friday, July 22nd 2016 at Zepp DiverCity Tokyo, will be live broadcasted in the Philippines! The live viewing will start from 6PM at the SM Megamall Cinema 6. Tickets are at PHP1,100 and comes with a free limited edition poster (to be claimed on July 22). Tickets are available exclusively at all SM Tickets outlets nationwide and online via smtickets.com. This will be GRANRODEO’s very first live viewing so don’t miss this chance to see their exciting performance! The rock unit GRANRODEO consists of two members, KISHOW (Kisho Taniyama) and e-ZUKA (Masaaki Iizuka). KISHOW, who is a voice actor and a vocalist, is famous not only for his acting skills but also for his talented and superb singing skills. On the other hand, e-ZUKA is a creator and a guitarist, who creates various genres of music from ear-catching songs to hard rock music. Not being bound to a specific genre, their music, from animation songs to rock music, keep attracting many fans. Celebrating the 10th anniversary of the band last year, they started off the 11th year this year with a release of their 24th single “TRASH CANDY,” and their long-awaited national tour is also confirmed! During this tour, they will perform 14 shows on a hot summer stage in 6 cities around Japan, including live houses, Osaka Castle Band Shell, and Hibiya Outdoor Music Hall. Moreover, their first live viewing will be their one man live! The excitement of performance at Zepp DiverCity Tokyo will be live broadcasted in movie theaters across Japan and Asia! Feel and enjoy the energetic live performance in real time! Live Viewing Japan Inc. is an “Alternative Contents” Provider in Japan which distributes exciting Japanese Entertainment to movie theaters around the world. LVJ is in charge of distribution of live entertainment content such as concerts, events and theatrical productions, to movie theaters and playhouses. Established in 2006, Cosplay.Ph is the premiere website and online community for Cosplay afficionados in the Philippines. Based in Makati City, the company has spearheaded some of the biggest cosplay events in the country, such as competitions, conventions and workshops. Cosplay.Ph has also provided avenues for hobbyists to come together, interact and share their passion to the world.